Beat the eggs until frothy. Add the sugar and beat for 30 minutes with an electric mixer (this is a recipe where a heavy duty mixer comes in handy!) until white, thick and creamy. Meanwhile, melt the stick of butter in the milk and add the vanilla. When the egg mixture is beaten, add 4 cups flour, 1 cup at a time, and the baking powder, salt, cinnamon, nutmeg and the melted butter mixture. The dough will be soft, but somewhat sticky, so it’s important to flour your hands and your work surface well. Add more flour, as needed, to roll the dough. Take a handful of dough and roll it into a long round strip (about the diameter of a nickel). Cut pieces about 2 inches long with a floured knife. Place the strips on a cookie sheet lined with parchment paper and bake for 8-10 minutes. Watch carefully, as ovens vary. In Recipes-list.com we have selected the most viewed recipes from category - uncategorized . Enjoy the best recipes specially selected for you! 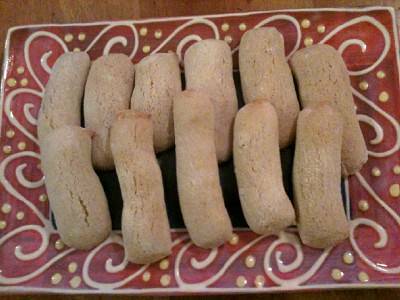 Aunt Ro’s Sicilian Cavadieda is the right choice that will satisfy all your claims.